Kenneth Lapatin, AFOH Board Member, co-organized and hosted a day-long symposium on the reception of Pompeii, Herculaneum, and the other Vesuvian cities to accompany the Getty Villa’s current exhibition “The Last Days of Pompeii: Decadence, Apocalypse, Resurrection.” Co-organizing with Victoria C. Gardner Coates and Jon L. Seydl, Ken introduced the slate of papers presenting a wide range of analysis on the modern reception of Pompeii. The five-paper event took place at the J. Paul Getty Villa auditorium. Although the exhibition ranges from the 18th to the 21st century, the presenters focused on about two centuries of literary and artistic reception of Pompeii. Victoria C. Gardner Coates spoke on “Slaves, Sluts, and Saints: the imaginary women of Pompeii,” and paid particular attention to three images of women associated with the destruction of the ancient city: “Nydia the Blind Flower Girl of Pompeii” (1854) sculpted by American Randolph Rogers, “Gradiva” (1939) by French surrealist painter André Masson, and Théodore Cassériau’s painting “Tepidarium: the room where the Women of Pompeii came to rest and dry themselves after bathing” (1853) which Dr. Coates connects to Théophile Gautier’s contemporary novel Arria Marcella. As with the last piece, her presentation also made connections to the fictional works by Bulwer-Lytton and Wilhelm Jensen from which the illustrated characters emerged. Shelley Hales presented information about her Crystal Palace Project, an online virtual model of the Pompeian Court (a physically constructed portion of London’s legendary Crystal Palace), and also spoke about 19th-century French and British reception of Pompeian domestic spaces. Particular attention was paid to Prince Jerome Napoleon’s Maison Pompéienne (Paris 1856) and to the history of the Pompeian Court at the Crystal Palace (1854). Dr. Hales’ presentation, “Virtual Interiors: inhabiting ‘Pompeian’ Houses in nineteenth-century Europe” probed archives for photographs pertaining to these long-gone edifices. “Pompeii and Trauma in European Postwar Sculpture” by Jon Seydl showed how visits to Pompeii affected postwar sculptors Germaine Richier, César, and Mario Marini, “the traumatized bodies at Pompeii stir[ring the sculptors] to dematerialize figures without recourse to formalism, abstraction, or historicism.” Fiorelli’s body casts played a particular role in the artists’ connection to the material of death at Pompeii. Since the exhibition presents new sculpture most students of Vesuvius will not have known, Dr. Seydl’s contribution in this segment of the symposium left respondents more silent. The catalog (see below) furthers one’s understanding beyond the grounding introduction offered so effectively at the symposium. 19th-century American “pyrodramatic” spectacles produced primarily at Coney Island then exported around the country by James Pain were the central topic of Nick Yablon’s contribution “The ‘Eruptive Sublime’: American visions of Pompeii, 1879 – 1914”. The talk examined American fascination with the Vesuvian cataclysm. Details pertaining to the establishment and dissemination of Pain’s extravaganza were brought to analysis. 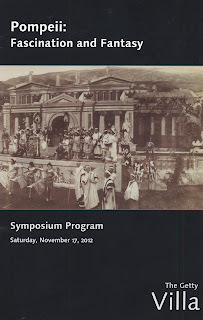 A 1903 photograph from the Library of Congress and a printed libretto from 1891 commemorate the spectacle in the exhibition and informed Dr. Yablon’s presentation. Adrian Stähli’s “The Last Days of Pompeii in Cinema” continued the theme treated by Yablon by examining how throughout the 20th Century filmmakers of many nationalities have focused their efforts on the destruction of Pompeii. The talk focused on several different productions, some of which are shared in clips throughout the current Getty exhibit. A rewarding, free-ranging panel discussion capped the afternoon, with all speakers responding to questions from the audience. In all, the symposium offered much unusual, new, and informed, analysis for those who consider the destruction of the Vesuvian cities to be interesting and central. A website explains details about the exhibition at the Getty. Some of the papers will be read again in a session of the APA/AIA meetings at Seattle in January. Look for information from the American Friends of Herculaneum on this website. Those who cannot see the show in Cleveland, Ohio, either — but, indeed, all whom the study of Pompeii and Herculaneum interests — at least will find much to learn in the extraordinary exhibition catalog — V.C.G., Coates, K. Lapatin, and J.L. Sedyl, edd., The Last Days of Pompeii: decadence, apocalypse, resurrection (Los Angeles and Cleveland, 2012), ISBN: 978-1-60606-115-2; $39.95. Seven essays are accompanied by half- and full-page color reproductions of the show’s 92 principal artifacts and dozens more color figures that make the analysis clear. The exhibition’s pieces come from as broad a field as the Getty can customarily draw, ranging from photographic evidence of allied bombing of Pompeii in WWII to Alma-Tadema’s “Exedra” (outside Pompeii’s Herculaneum Gate) to a Warhol Vesuvius (1985). No fewer than three of Rogers’s Nydias, in two sizes, are on comparative display; though only four of Allan McCollum’s plaster-cast dogs fit into the Getty showspace. (More are coming to Cleveland. Also more Warhols and more Rothkos.) A few ancient artifacts — a fresco, an extraordinary cabinet of smaller objects “excavated” at Pompeii and given by Ferdinand II to Pope Pius IX generously loaned by the Vatican— ground the exhibition in antiquity. Trying to list only a handful of representative works from this deep and provocative collection seems as futile as the prospect of excavating Herculaneum’s most valuable treasures in a lifetime. The catalog is informative, elegant, utterly worth owning.